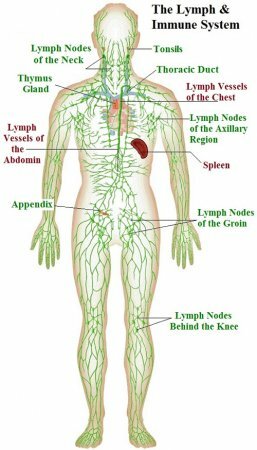 The lymphatic system is a system of capillaries, vessels, nodes and other organs that transport a fluid called lymph from the tissues as it returns to the bloodstream. The lymphatic tissue of these organs filters and cleans the lymph of any debris, abnormal cells, or pathogens. The lymphatic system also transports fatty acids from the intestines to the circulatory system. - Monocytes. Monocytes are agranular leukocytes that can form 2 types of cells: macrophages and dendritic cells. 1. Macrophages. Monocytes respond slowly to infection and once present at the site of infection, develop into macrophages. Macrophages are phagocytes able to consume pathogens, destroyed cells, and debris by phagocytosis. As such, they have a role in both preventing infection as well as cleaning up the aftermath of an infection. 2. Dendritic cells. Monocytes also develop into dendritic cells in healthy tissues of the skin and mucous membranes. Dendritic cells are responsible for the detection of pathogenic antigens which are used to activate T cells and B cells. 1. Eosinophils. Eosinophils are granular leukocytes that reduce allergic inflammation and help the body fight off parasites. 2. Basophils. Basophils are granular leukocytes that trigger inflammation by releasing the chemicals heparin and histamine. Basophils are active in producing inflammation during allergic reactions and parasitic infections. 3. Neutrophils. Neutrophils are granular leukocytes that act as the first responders to the site of an infection. Neutrophils use chemotaxis to detect chemicals produced by infectious agents and quickly move to the site of infection. Once there, neutrophils ingest the pathogens via phagocytosis and release chemicals to trap and kill the pathogens. - T lymphocytes. T lymphocytes, also commonly known as T cells, are cells involved in fighting specific pathogens in the body. T cells may act as helpers of other immune cells or attack pathogens directly. After an infection, memory T cells persist in the body to provide a faster reaction to subsequent infection by pathogens expressing the same antigen. - B lymphocytes. B lymphocytes, also commonly known as B cells, are also cells involved in fighting specific pathogens in the body. Once B cells have been activated by contact with a pathogen, they form plasma cells that produce antibodies. Antibodies then neutralize the pathogens until other immune cells can destroy them. After an infection, memory B cells persist in the body to quickly produce antibodies to subsequent infection by pathogens expressing the same antigen. - Natural killer cells. Natural killer cells, also known as NK cells, are lymphocytes that are able to respond to a wide range of pathogens and cancerous cells. NK cells travel within the blood and are found in the lymph nodes, spleen, and red bone marrow where they fight most types of infection. - Thoracic duct. The thoracic duct connects the lymphatic vessels of the legs, abdomen, left arm, and the left side of the head, neck, and thorax to the left brachiocephalic vein. - Right lymphatic duct. 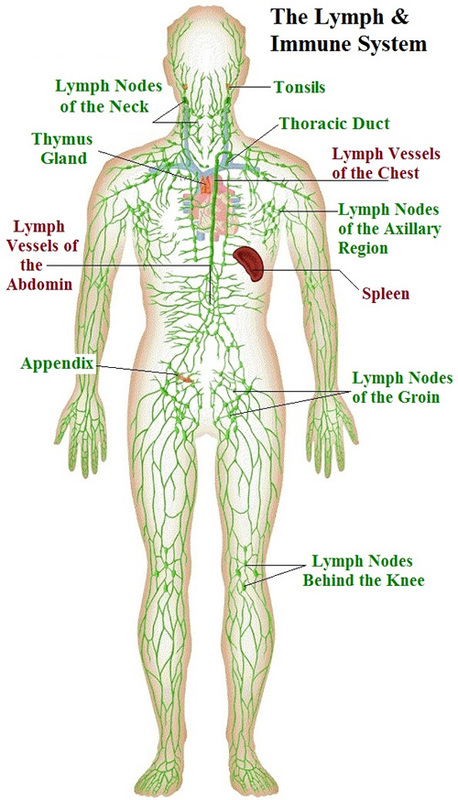 The right lymphatic duct connects the lymphatic vessels of the right arm and the right side of the head, neck, and thorax to the right brachiocephalic vein. - Tonsils. There are 5 tonsils in the body—2 lingual, 2 palatine, and 1 pharyngeal. The lingual tonsils are located at the posterior root of the tongue near the pharynx. The palatine tonsils are in the posterior region of the mouth near the pharynx. The pharyngeal pharynx, also known as the adenoid, is found in the nasopharynx at the posterior end of the nasal cavity. The tonsils contain many T and B cells to protect the body from inhaled or ingested substances. The tonsils often become inflamed in response to an infection. - Peyer’s patches. Peyer’s patches are small masses of lymphatic tissue found in the ileum of the small intestine. Peyer’s patches contain T and B cells that monitor the contents of the intestinal lumen for pathogens. Once the antigens of a pathogen are detected, the T and B cells spread and prepare the body to fight a possible infection. - Spleen. The spleen is a flattened, oval-shaped organ located in the upper left quadrant of the abdomen lateral to the stomach. The spleen is made up of a dense fibrous connective tissue capsule filled with regions known as red and white pulp. Red pulp, which makes up most of the spleen’s mass, is so named because it contains many sinuses that filter the blood. Red pulp contains reticular tissues whose fibers filter worn out or damaged red blood cells from the blood. Macrophages in the red pulp digest and recycle the hemoglobin of the captured red blood cells. The red pulp also stores many platelets to be released in response to blood loss. White pulp is found within the red pulp surrounding the arterioles of the spleen. It is made of lymphatic tissue and contains many T cells, B cells, and macrophages to fight off infections. - Thymus. The thymus is a small, triangular organ found just posterior to the sternum and anterior to the heart. The thymus is mostly made of glandular epithelium and hematopoietic connective tissues. The thymus produces and trains T cells during fetal development and childhood. T cells formed in the thymus and red bone marrow mature, develop, and reproduce in the thymus throughout childhood. The vast majority of T cells do not survive their training in the thymus and are destroyed by macrophages. The surviving T cells spread throughout the body to the other lymphatic tissues to fight infections. By the time a person reaches puberty, the immune system is mature and the role of the thymus is diminished. After puberty, the inactive thymus is slowly replaced by adipose tissue. The body has many innate ways to defend itself against a broad spectrum of pathogens. These defenses may be external or internal defenses. The internal defenses include fever, inflammation, natural killer cells, and phagocytes. The coverings and linings of the body constantly prevent infections before they begin by barring pathogens from entering the body. Epidermal cells are constantly growing, dying, and shedding to provide a renewed physical barrier to pathogens. Secretions like sebum, cerumen, mucus, tears, and saliva are used to trap, move, and sometimes even kill bacteria that settle on or in the body. - Fever. In response to an infection, the body may start a fever by raising its internal temperature out of its normal homeostatic range. Fevers help to speed up the body’s response system to an infection while at the same time slowing the reproduction of the pathogen. - Inflammation. The body may also start an inflammation in a region of the body to stop the spread of the infection. Inflammations are the result of a localized vasodilation that allows extra blood to flow into the infected region. The extra blood flow speeds the arrival of leukocytes to fight the infection. The enlarged blood vessel allows fluid and cells to leak out of the blood vessel to cause swelling and the movement of leukocytes into the tissue to fight the infection. - Natural Killer Cells. Natural killer (NK) cells are special lymphocytes that are able to recognize and kill virus-infected cells and tumor cells. NK cells check the surface markers on the surface of the body’s cells, looking for cells that are lacking the correct number of markers due to disease. The NK cells then kill these cells before they can spread infection or cancer. - Phagocytes. The term phagocyte means “eating cell” and refers to a group of cell types including neutrophils and macrophages. A phagocyte engulfs pathogens with its cell membrane before using digestive enzymes to kill and dissolve the cell into its chemical parts. Phagocytes are able to recognize and consume many different types of cells, including dead or damaged body cells. - Cell-mediated Specific Immunity. When a pathogen infects the body, it often encounters macrophages and dendritic cells of the innate immune system. These cells can become antigen-presenting cells (APCs) by consuming and processing pathogenic antigens. The APCs travel into the lymphatic system carrying these antigens to be presented to the T cells and B cells of the specific immune system. - Antibody-mediated Specific Immunity. During an infection, the APCs that travel to the lymphatic system to stimulate T cells also stimulate B cells. B cells are lymphocytes that are found in lymphatic tissues of the body that produce antibodies to fight pathogens (instead of traveling through the body themselves). Once a B cell has been contacted by an APC, it processes the antigen to produce an MHC-antigen complex. Helper T cells present in the lymphatic system bind to the MHC-antigen complex to stimulate the B cell to become active. The active B cell begins to reproduce and produce 2 types of cells: plasma cells and memory B cells. 1. Plasma cells. Plasma cells become antibody factories producing thousands of antibodies. 2. Memory B cells. Memory B cells reside in the lymphatic system where they help to provide immunity by preparing for later infection by the same antigen-presenting pathogen. - Acquired Immunity. Under most circumstances, immunity is developed throughout a lifetime by the accumulation of memory T and B cells after an infection. There are a few ways that immunity can be acquired without exposure to a pathogen. Immunization is the process of introducing antigens from a virus or bacterium to the body so that memory T and B cells are produced to prevent an actual infection. Most immunizations involve the injection of bacteria or viruses that have been inactivated or weakened. Newborn infants can also acquire some temporary immunity from infection thanks to antibodies that are passed on from their mother. Some antibodies are able to cross the placenta from the mother’s blood and enter the infant’s bloodstream. Other antibodies are passed through breast milk to protect the infant.